There's always a satisfying feeling when you use the last drop or ounce of a makeup product, perfect time to try something new right :) So after finishing my every day foundation Rimmel Wake Me Up, I decided I really need to try out the L'Oreal True Match, I must be the only one who hasn't tried it! I really don't like having lots of bases because I'll never use them up in the 12 months and it'll go to waste. The much loved L'Oreal True Match has a huge host of shades, I picked up W3 Golden Beige, which seem ideal for my yellow based skin tone. It says it's super blendable, non cakey and matches skin tone with SPF17. Off the bat I applied it with my Real Techniques expert face brush but I kept having to really blend and buff it into my skin. It did not blend in as smoothly as I wanted, I could still see streaky brush marks. What do you use to apply this foundation, maybe I need to try it with a Kabuki or stippling brush? Colour match wise, I'm really impressed as it's not too yellowy or pinky. It leaves a really smooth and even finish, not too matte or dewy. I tested it without powder for a day and it held up quite well, there was a few patchy areas around my nose and mouth but it still looked pretty good. It's oil free too, perfect for oily and combo skin gals. Also for £10 it's affordable and makes my skin look great. The pump is ideal at dispensing how much product you actually need, not too much like some other pumps! With my short straight Asian lashes, waterproof mascaras are the only way to go for me. The L'Oreal Volume Million Excess waterproof in black has a thick plastic wand with a slight curve and tapered end. I layer on the coats and it's great for building length, separation and definition but not as much volume as my favourite mascara - Maybelline Falsies Waterproof. I love how waterproof mascaras have a drier formula and really keep my curl in place without drooping, this L'Oreal version is no exception. My old MAC eyelash curler were getting really worn out so I picked up a new one, for £16 it's a bit cheaper than the Shu Uemura curler but I love the MAC one. They work just as well, gentle to use and leaves you with a nice long lasting curl. I also love the black design, super sleek - all round win. Funny enough, I just bought the Loreal True Match today! I will have to see how well it fit with my skin! I have them Asian short lashes too, always wanted to try it out but never have. I've tried the other one, I don't actually rmb the name but it said a formula for Asians lol. It was pretty good. Congrats on finishing up products AND being able to hold off new purchases till you did! I'm trying to adhere to a one-in-one-out rule but it's sooooo hard. As for the foundation... maybe try a stippling brush? Ierno... that's what I use and I have never had a streaky problem. You're not the only one, I haven't tried True Match yet either haha! I really really want to though, it sounds pretty great but I dislike foundations that don't blend easily. I guess you'll have to experiment a bit though! Hi Emma, have you used the foundation yet - what do you think? Hi Diana, the eco tools buffing brush does sound idea and your application process sounds spot on! I know....alot of restraint, if only the bottles were smaller I would experiment alot more with bases! I really enjoy using it too! I usually leave my moisturiser to settle for a good 10 minutes, so i'll defo try and apply it soon after for a more smoother application, hopefully! Hey lovely! I totally agree with you on the L'oreal foundation - it is so hard to blend! The colour match is perfect though. It's sitting on my makeup desk and I'm not sure if I'll be reusing it! Mmm. I've also used the concealer, which I love because of the colour match! whats your thoughts on the Rimmel Wake Me Up foundation? i've heard so many great things about it. L'OREAL is by far my fave drugstore brand. 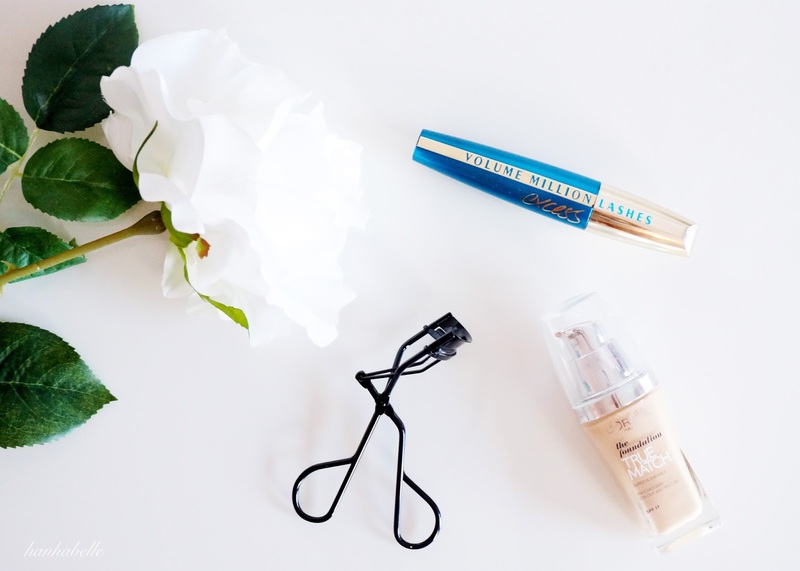 I can't live without their mascaras or foundations! I know their eye shadows and liners are my favs! I just wish I got to try the Telescopic waterproof mascara before they got discontinued! I love L'Oréal True Match as well! I also picked up W3, which is sadly a teeny tiny bit too warm for me, but there's nothing that a little blending can't fix. haven't tried either of these, thanks for sharing! That's a shame, I know it's not for everyone!